Variante initiale du P-40, également connu comme Curtiss Model 81A-1. Un total de 199 avions de cette variante ont été construits. 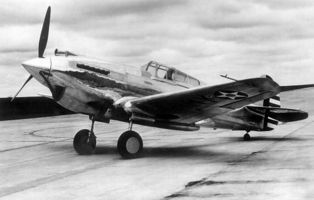 The P-40 was similar to the final XP-40 configuration except for the use of 1040 hp V-1710-33 (C15) engines. The armament was the standard USAAC armament of the day-two 0.50-inch machine guns, mounted in the upper nose and synchronized to fire through the propeller arc. Provisions were made for the mounting of one 0.30-inch machine gun in each wing. Flush riveting was used to reduce drag. Armor, bulletproof windshields, and leakproof fuel tanks which were not initially fitted, were later added to the aircraft while it was in service. The P-40 was a relatively clean design, and was unusual for the time in having a fully retractable tailwheel. The first flight of a P-40 (Ser No 39-156) was on April 4, 1940. Maximum speed was 357 mph at 15,000 feet, service ceiling was 32,750 feet, and initial climb rate was 3080 feet per minute. An altitude of 15,000 feet could be reached in 5.2 minutes. Cruising speed was 272 mph, landing speed was 80 mph, and the range at 250 mph was 950 miles. The length of the P-40 was 31 feet 8 3/4 inches, which became standard for all early models. Weights were 5376 pounds empty, 6787 pounds gross, and 7215 pounds maximum. Deliveries of the P-40 to Army units began in June of 1940. Three of the P-40s were used for service testing, the USAAC contract making no provisions for the standard practice of supplying YP models. They were delivered with full camouflage applied-olive drab on the top and grey on the undersides. The standard rudder stripes and star insignia were applied to both wings. The first USAAC units to operate the P-40 were the 33rd, 35th and 36th Pursuit Squadrons of the 8th Pursuit Group, based at Langley Field, Virginia. It was soon followed by the 55th, 77th, and 79th Pursuit squadrons of the 20th Pursuit Group at Selfridge Field, Michigan, and the 21th, 34th, and 70th Pursuit Squadrons of the 35th Pursuit group which trained on P-40s prior to being issued with P-39s. 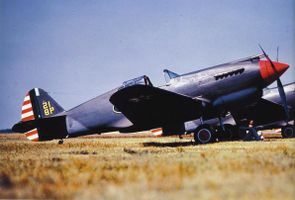 Foreign air forces were beginning to take notice of the P-40, and in May of 1940, the Armee de l'Air of France placed an order for 140 H-81As (export model of the P-40). Only 200 of the initial P-40 order were actually completed as P-40s. Serials were 39-156/280 and 40-292/357 (c/ns 13033/13232). In September of 1940, the remaining 324 aircraft of the initial order had their delivery deferred to enable Curtiss to expedite the delivery of the 140 French-ordered H-81As. The first export aircraft had actually been completed in French markings in April of 1940. 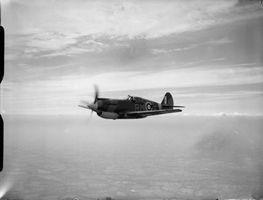 However, none of these machines actually reached France before the June 1940 Armistice, and the contract was taken over by the Royal Air Force as the Tomahawk I. 16 P-40s were sent to the Soviet Union after the German invasion. The P-40 lacked such things as armor for the pilot, self-sealing fuel tanks, and a bulletproof windshield, so it was not considered as being suitable for combat. On October 22, 1942, those P-40s still in USAAF service were ordered restricted from combat duty and were redesignated RP-40.